There are a lot of RV parks that are located in the general area of where the fish are active. However, it’s not easy to find one where you can enjoy fishing just steps from your RV site. My wife and I enjoyed this type of experience during a trip through Clinton, Montana, after enjoying a tour of the Lewis and Clark Trail. 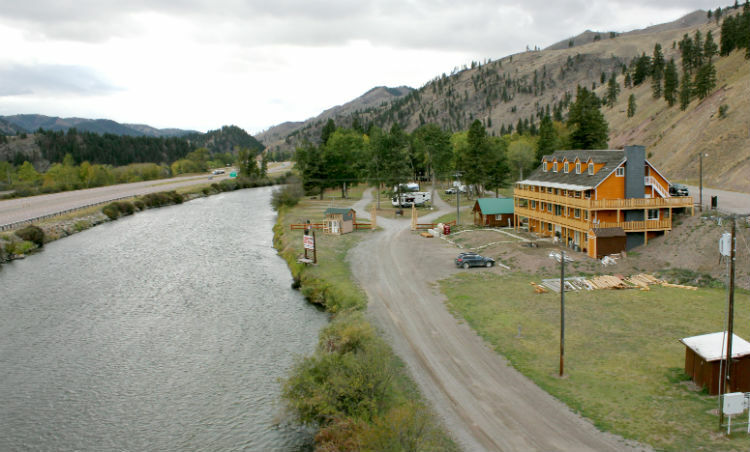 Located in rural Clinton, Montana, Bearmouth RV Park has great views of the mountains with great fishing. Photo courtesy of Bearmouth RV. Understanding the Lewis and Clark Trail and tracking the route through Oregon, Idaho, Montana, and North Dakota is something every RVer should do. Experiencing Fort Mandan and Yellowstone where the party built rafts to transport a wounded explorer to reach Lewis on the Missouri is something I won’t forget. With a real feel for the terrain I read about so often in various journals, the stories came alive. While the trip was very enlightening, I still needed a bit more success when it came to fly fishing. 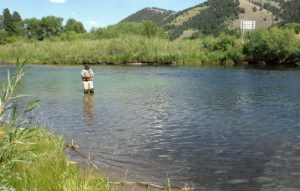 I had landed some fish on the Lochsa River; I sweated the 100-degree weather on the legendary rainbow waters of the Big Horn. However, I didn’t really have a chance to find a great place to catch fish and work on my skills. While we were half-an-hour away from Missoula, this seemed to have some potential. The Clarks Fork River flows into Lake Ponderay. 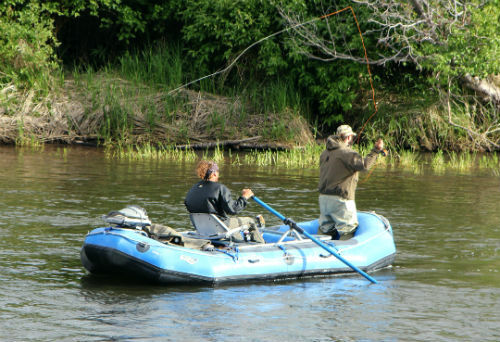 It’s also one of the major rivers that offer active trout fishing in Montana. The river helped Clark find a good route around the Rockies to the southern part of the State. It’s also populated with great cutthroat trout. Many miles of the river is right off the highway. There is so much river, I was sure there was a good chance to catch a fish or two. We pulled off at Bearmouth Creek, then drove a few hundred yards to the Bearmouth RV Park (formerly the Bearmouth Chalet RV Park). This was a great choice. Owner Paul Alamo is making great strides with the services and grounds. What I like is the river wraps around the property. In addition, with permission from adjacent public waters, there are two miles to fish. The river is the perfect size and depth. It’s about knee deep and is 50 feet across. It weaves its way through vegetation with lots of wildlife. I also realized it was full of foot-long cutthroat. It wasn’t long after that I had my rod on the table and was rigging my line. I then looked for a place to drop down to the river, which ended up being within 100 feet from my RV. Twenty minutes later, I had landed three fish. I didn’t get into a big hatch or anything. However, I saw a couple of fish rise and was able to fool a few on elk hair caddis and parachute Adams dry flies. The shore features brush and the river is shallow enough to cast cleanly. As I walked back to the RV, I passed a dog protecting a campsite. He really was looking for some petting and pretty soon Paul—the dog’s owner—asked about my success with the fish. He then offered to give me a ride and show me around on his ATV. In addition of offering a lodge, cute little cabins, and some very pet-friendly sites, this RV park has some great views of the mountains. The river also has the kind of bends and turns that create great fishing. The RV park is also close enough to the larger center of Missoula. I had some great conversations with Paul and discussed an outing concerning my fly fishing club for my next trip! We want to camp here sometime soon. That sounds like a great place! I’m a sometime fly fisher (not often enough to stop being a horrid caster, and seldom have time to fish at all), and I tend to focus on warm-water species. That’s partly out of necessity, since I live in the southern California megalopolis, and partly because I like to eat freshwater fish, and even in a highly pressure environment like this, there are enough bluegill to keep some for the table. That looks like a great place to learn to C&R some stream trout, though. Fishing moving water is also something I have zero experience with. The San Diego “River” is pure stillwater except when it rains a lot; then, it’s unfishable because it’s a flood (channelized, mostly, but still flood stage). I was in West Yellowstone over July 4th this summer, and while I didn’t have time to fish (it as family time), it as an amazing fly experience anyway. We drove into West Yellowstone in the evening, along the Gallitin, and it was incredible – and I still have some bugs from the evening hatch stuck in some places on the MH lol), and in the town itself, there were fly shops everywhere. I’d love to get back there and take some lessons with a guide in the future. Will sure put Bearmouth on my list, too. Thanks for the great article! In my mind, “fishing” means going to the local grocery story to buy “fish”, and is no different from buying steak. In my lifetime of over 70 years, I’ve tried all the usual things people attribute to male interests, and I quickly discovered that “fishing” isn’t one I can enjoy. The process of “fishing” is tedious, boring, and unproductive, given what can be achieved by a quick trip to the supermarket. If you equate the experience fishing with going to the supermarket to buy fish, then you really have NO IDEA what fishing is all about. Most people don’t even keep all the fish they catch. They use the “catch and release” method of fishing. Fishing is about being outdoors, smelling the air, hearing the sounds of the water rushing by and birds singing in the trees. Fishing is about immersing yourself in nature which, in my opinion, is also why most people like camping and RVing. Based on your comments, it sounds like you are one of those people who bought a huge RV with tvs inside and out and who rarely steps outside of his rig other than to disconnect from the power pole. Of course fishing would be boring to you…..you need the stimulation of the network programmers to be entertained. That’s fine for some people, but that is not what fishing and being in the great outdoors is all about. You are welcome to your opinion, of course, as are all, but please rephrase your last statement to say….”As for me” or “In my opinion” the process of fishing is tedious. Don’t declare that like some sort of mandate! It’s unfortunate that since YOU don’t enjoy fishing you felt the urge to broadcast your negativity by “throwing a bucket of cold water” on those that we’re just dreaming of the experience they were reading about. I don’t fish, but I sure could share in the enjoyment just being out there near the river with any fishermen…or campers, or hikers! Im sure you’ve heard: “if you can’t say anything nice, don’t say anything at all”. If you weren’t interested in fishing, move on to the next article. These folks were just sharing a nice experience they had. I’ve already tagged this RV park on my Google Earth app. I plan to stay there and get my line wet. Can’t wait to catch one of those cutthroat trout and put it on the grill. 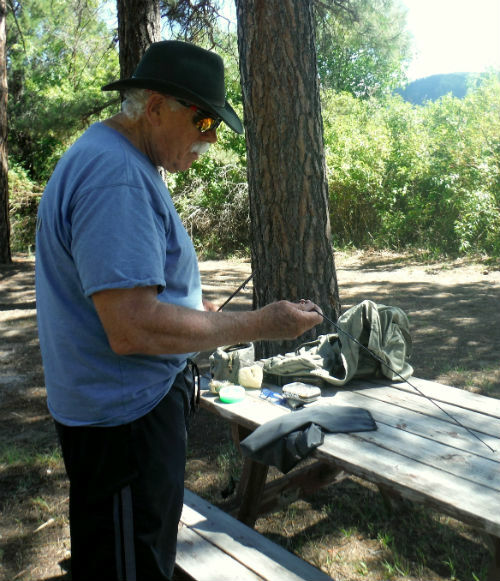 I have never fished since about 1957 at a camp in Bear Mountain NY. The minnows stole the bait off the hook and I caught nothing. That said, a place like what is described here sounds like one of the many paradises to be found, and I couldn’t care less if I caught anything, whether fly fishing, or fishing from a rowboat. I know nothing about fishing, but I feel it has its attractions, and what is intriguing me is about being in, and surrounded by, nature. Not tourist attractions, not man made venues, but what is and was always there.